It's another boring Tuesday cleaning the transporter pad of "accidents" on Megalodon-9 when the call comes in. 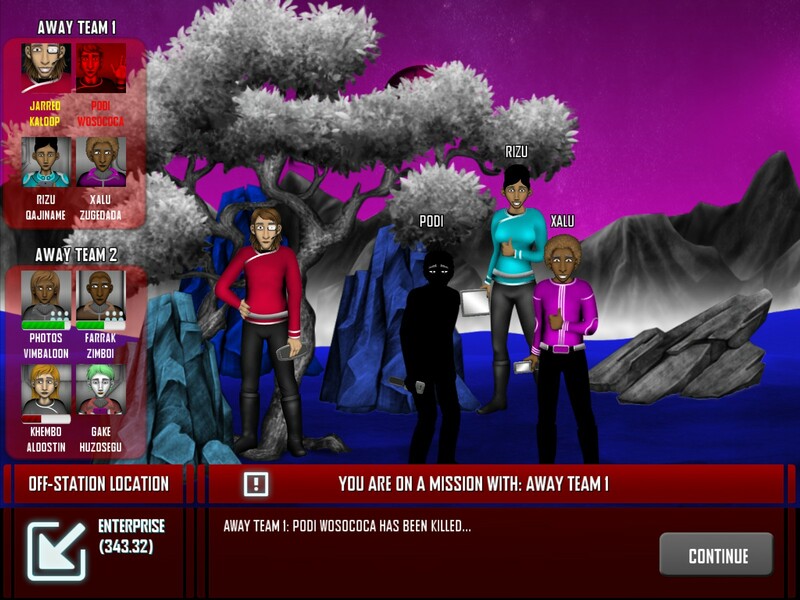 As luck would have it, I've been randomly selected for an away mission to a nearby planet! But, whatever excitement I had is quickly diminished when 4 of my fellow away team members are almost immediately disintegrated by some horrible trans-dimensional beast just minutes after our arrival. I soon find myself spiraling into a depression when I learn that one of my closest colleagues is among the deceased. So, once we're back aboard Megalodon-9, I invite my fellow survivors out for drinks at the local watering hole (or space watering hole) to try and cheer everyone up. Unfortunately only one person bothered to show, further adding to my sadness that's barely improved by all the booze. Then I find out my boss is mad that I didn't invite him, and has sent me a passive aggressive email to complain. And the next morning my girlfriend decides to break up with me. Such is life as a Redshirt in Redshirt. 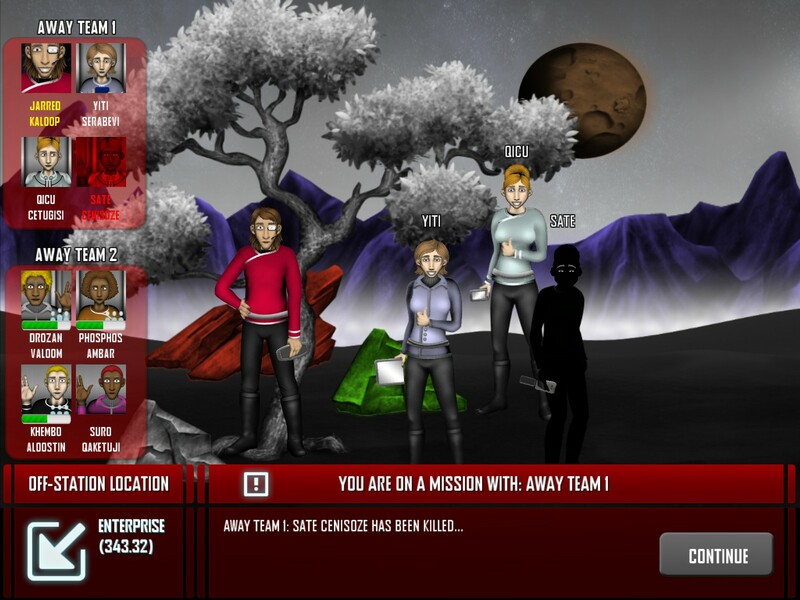 Being developed by Mitu Khandaker of The Tiniest Shark and Positech Games, Redshirt is a sci-fi simulation/strategy game that draws a few parallels to The Sims, if The Sims featured phasers, tentacled aliens and social media. It puts you in control of a brand new Federation recruit transferred to an aging space station orbiting a resort planet and given the lowly rank of "Transporter Accident Cleanup Technician," which is as thankless a job as it sounds. 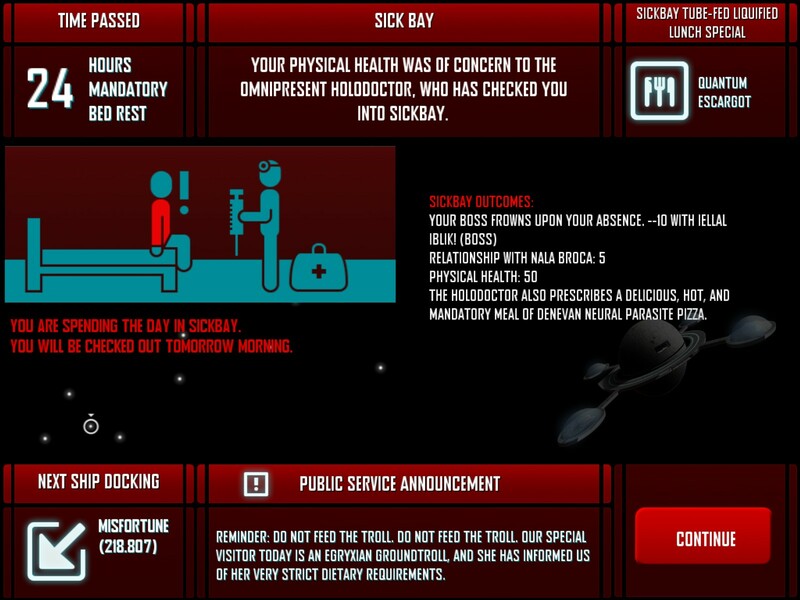 Shortly after your arrival, you receive an ominous email from a coworker that something bad might happen in the next 180 days - and your scheduling computer highly recommends you book shore leave. This dire warning kicks off your quest to schmooze your way up the hierarchy so that not only are you important enough to avoid getting sent on a suicidal away mission, but a big enough deal that you won't get left behind if something disastrous happens. 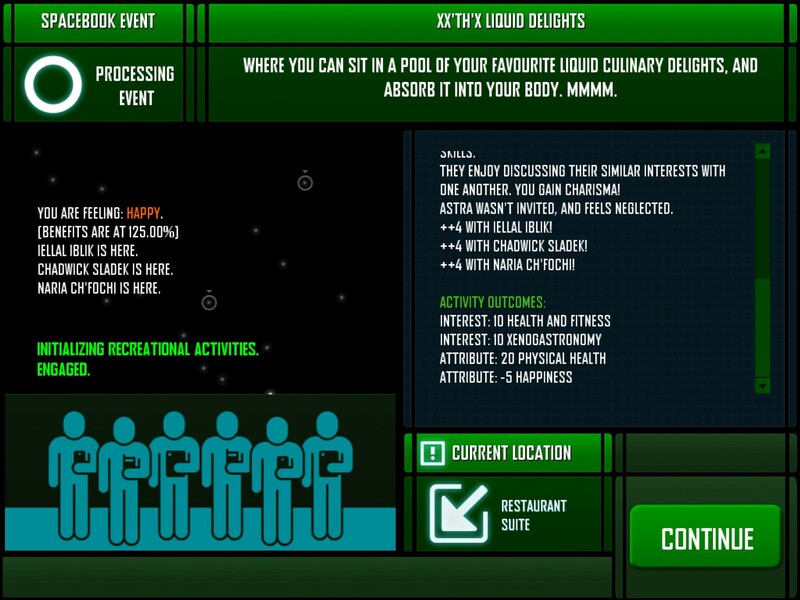 Your character, be they human or one of a few alien species, will need your help in managing their daily life to ensure they stay both happy and healthy, primarily through the social networking site Spacebook. 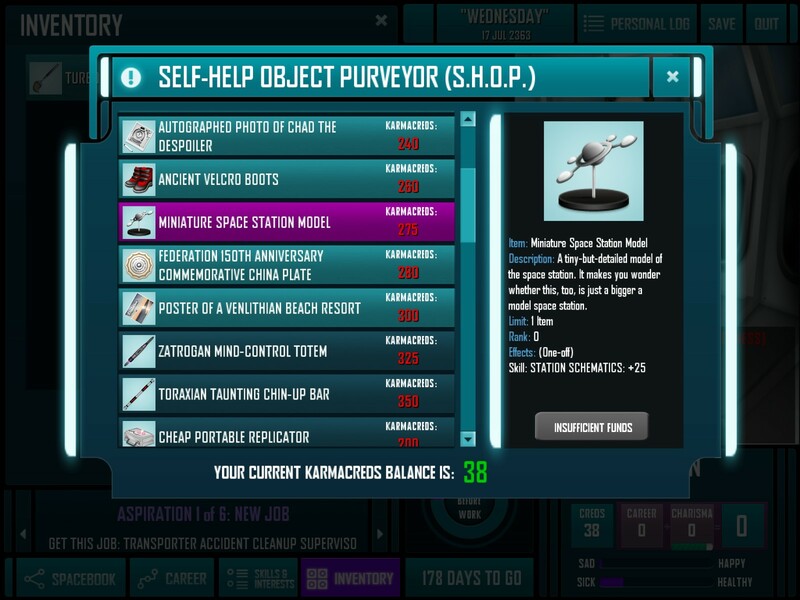 As you have a limited number of actions per day (due to a law designed to prevent social-media related procrastination, obviously), you'll need to decide exactly how you're going to use each action in between shifts cleaning up the transporter room or repainting the ship's outer hull. Do you like your boss' latest update, or do you send a flirty message to a coworker instead? 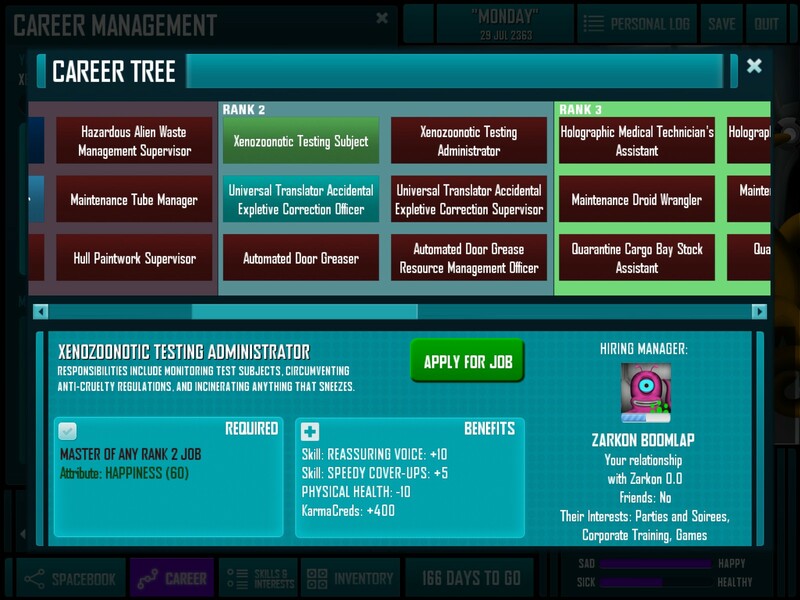 Do you spend your credits on a cybernetic cat or pay for lessons on how to be a good bureaucrat? Who should you invite to dinner, a bunch of friends or just that one special someone - and where exactly should you eat, the Make It Pho noodle joint, or the Blaster Burger restaurant? 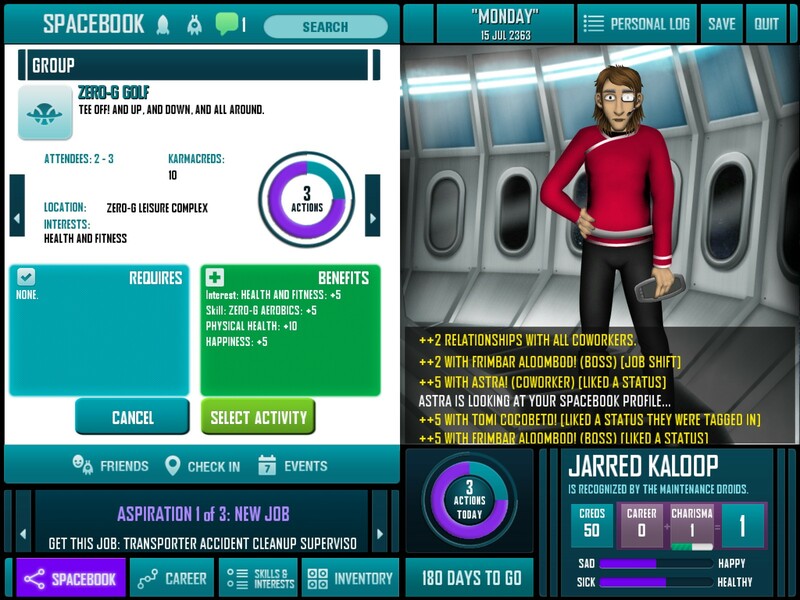 While there's a great deal of humor in Redshirt, which definitely pokes fun at the likes of Star Trek, Star Wars and other sci-fi classics, what makes Redshirt interesting is how it quickly becomes this challenging balancing act of your character's stats, funds, and social life. I found myself having to carefully manage my character's time to ensure that I was paying attention to all of the people within my social networkas well as brushing up on any skills relevant to applying for a better job than "Automated Door Greaser." I learned quickly that if I didn't actively invite people to events or message them over Spacebook, it could damage my positive reputation and even hurt my career prospects. Plus, I had to consider how to budget out money for daily meals, stat-boosting items and social events to ensure that my character remained in top shape. Managing all these aspects of my character gives Redshirt a kind of addictive one-more-turn style of play you usually only see in games like Civilization. I was surprised to see how much real life time I could lose trying to ensure my character's romantic relationship with a coworker stayed in the green while schmoozing up to the hiring manager of another department. 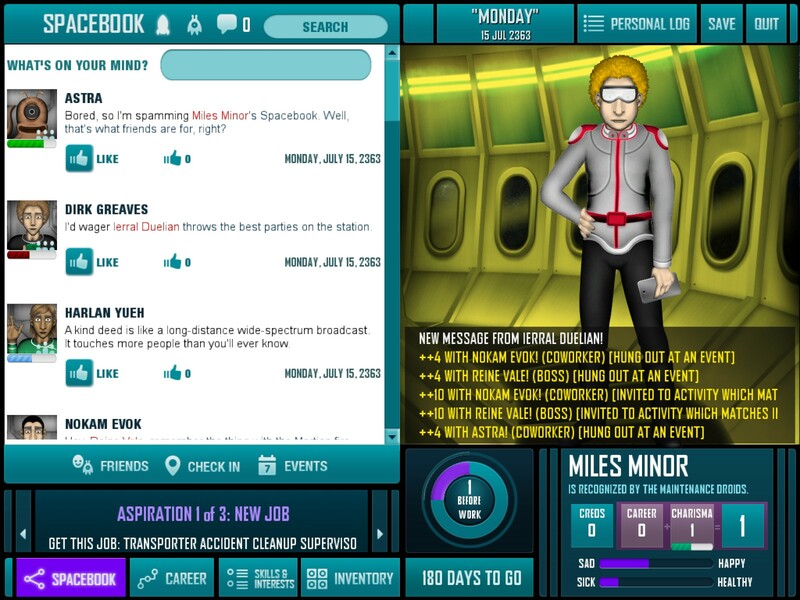 As Redshirt is still currently in the works, there are a handful of text based bugs and broken menus, and one hilarious glitch had a former coworker who had died in my first away mission haunting my Spacebook with random posts and insults (apparently beyond the grave, since their profile marked them as deceased). 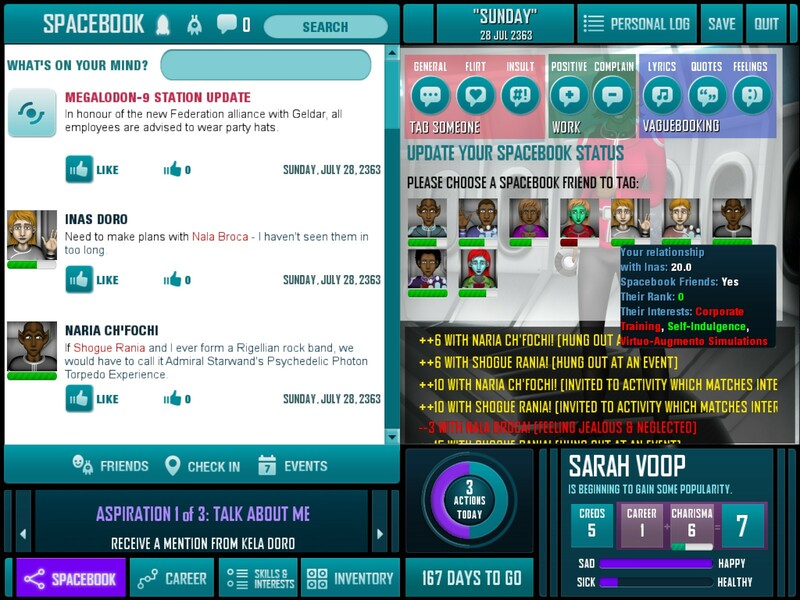 Plus, the UI can be clunky to navigate, especially when it comes to setting up events or finding new people to add to your social circle. Some additional ways to sort and organize your friends list via interests would be nice to see in the final version. Bugs aside, the alpha of Redshirt is a very humorous spin on how those nameless minions we often see in the backgrounds of our favorite sci-fi movies live their lives. 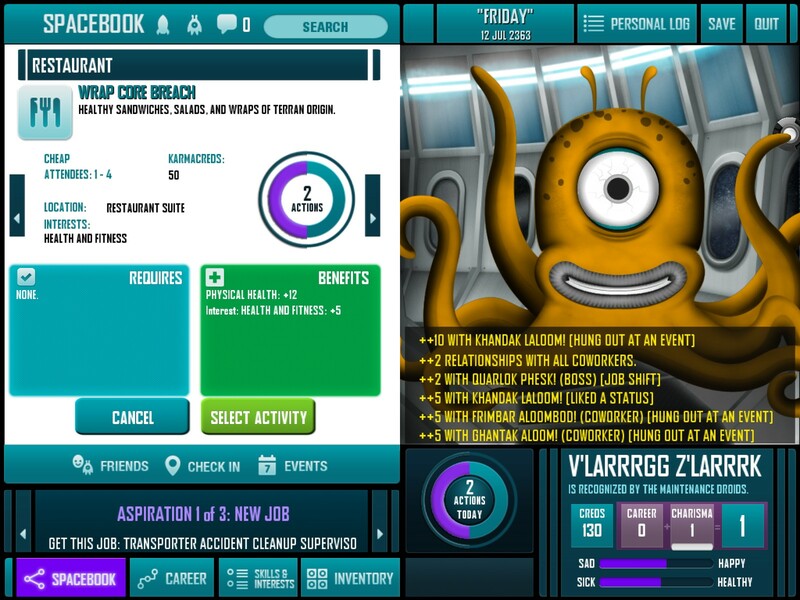 Fans of Star Trek should definitely keep an eye out for when Redshirt is arrives later this year on the PC, Linux and Mac.